Much has been made of the growing alliance between Russia, Iran and Turkey. In fact, leaders of those three countries have met at least 3 times in the past several months, and are planning another meeting together in Russia within the next few weeks. In the context of Ezekiel 38, most Bible believers agree the stage is being set for the fulfillment of Ezekiel’s prophecy. 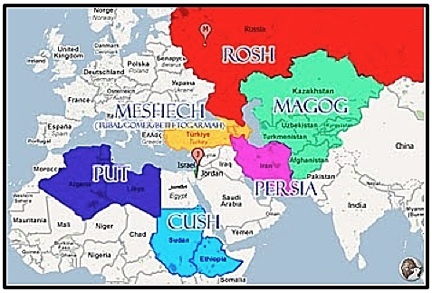 But what about Ethiopia (Cush) and Put, the other two regions Ezekiel envisioned in the northern invasion? Some have argued the stage is NOT set for the Ezekiel 38 prophecy because those players are not yet in the game. But aren’t they? Check out these headlines (and read an article or two) and you will find that Libya and Sudan are very much in the game! What’s Behind Sudan’s “Rapproachement” with Russia? Indeed, the Gog-like Russian president, Vladimir Putin, is positioning Russia as a key player in Libya. With a weak Russian economy, it is believed Putin is angling for billions in reconstruction contracts, a share of North Africa’s abundant oil reserves and a naval base on the Mediterranean Sea. There is most certainly Russian activity in Libya, Algeria and Sudan. Thus, arguments that the entire coalition is yet to take shape are becoming less and less accurate as Russia works for their own best interests in both Libya and Sudan. Days are short. Are you ready for the Lord’s return? Me too, Bibleguy! But we’ve got work to do until He comes. Stay faithful! Blessings! Yes we do and by the Grace of God I will stay faithful.